The process of lacto-fermentation is an ancient preservation method used in many cultures that transforms vegetables and fruits into ultra-nourishing foods, full of beneficial bacteria and enzymes. Proper fermenting methods cause lactobacilli, bacteria that occur on most living things, to proliferate and produce lactic acid that preserves food and inhibits putrefying bacteria. The proliferation of lactobacilli in fermented vegetables enhances their digestibility and increases vitamin levels while producing antibiotic and anticarcinogenic substances. Lactic acid also promotes the growth of healthy flora throughout the gut. Lacto-fermented vegetables and fruit are not meant to be eaten in large quantities, but as condiments, such as with meat, fish, or properly prepared grains. Once you master the basic method of lacto-fermentation, the flavor possibilities are endless with various types of vegetables, fruits and spices. Homemade Sauerkraut from Real Food Family on Vimeo. *To make whey, you may start with fresh raw milk, raw milk yogurt, or a high quality whole-milk yogurt. If using fresh raw milk, let stand at room temperature in a covered container for 3-4 days until it completely separates. Line a large strainer set over a bowl with a clean dishtowel or cheese cloth. Pour in the yogurt or separated milk and let stand for several hours until all the liquid strains into the bowl. Without squeezing, wrap the solids with the cloth and hang by a wooden spoon over the bowl to allow any extra whey to strain out. When whey stops dripping, store this whey and homemade cream cheese in separate covered containers. Refrigerated, cream cheese will last for 1 month, and whey for 6 months. Place 4-5 cups of lightly chopped vegetables or fruit into a large bowl. Use a wooden pounder or meat hammer to mash into small pieces, releasing natural juices. Stir 1 tablespoon of salt into mixture, plus ¼ cup whey or an additional tablespoon of salt if whey will not be used. Place mashed vegetables or fruit into a mason jar or other airtight container with juices and add enough filtered water (only needed if juice from the fruit or vegetable isn’t enough) to fill contents to one inch below top of jar, leaving enough room for the contents to expand. Close the jar very tightly with an airtight lid. Place at room temperature for 2-4 days, then transfer to a dark cool spot, such as the top shelf of a refrigerator, a wine cellar, or other area kept at around 40°F for 10-12 more days to complete lacto-fermentation. Flavor and beneficial bacteria will increase with time, but fermented vegetables or fruit can be eaten immediately after the initial days of fermentation. Sometimes lacto-fermented foods can get bubbly or develop spots or white foam on top. This is no cause for concern, simply remove with a spoon. A failed fermentation will result in a putrid smell that would be too awful to consider eating. Successful lacto-fermentation will result in vegetables and fruits with a pleasantly soured taste that remain preserved for several weeks or months in cold storage. 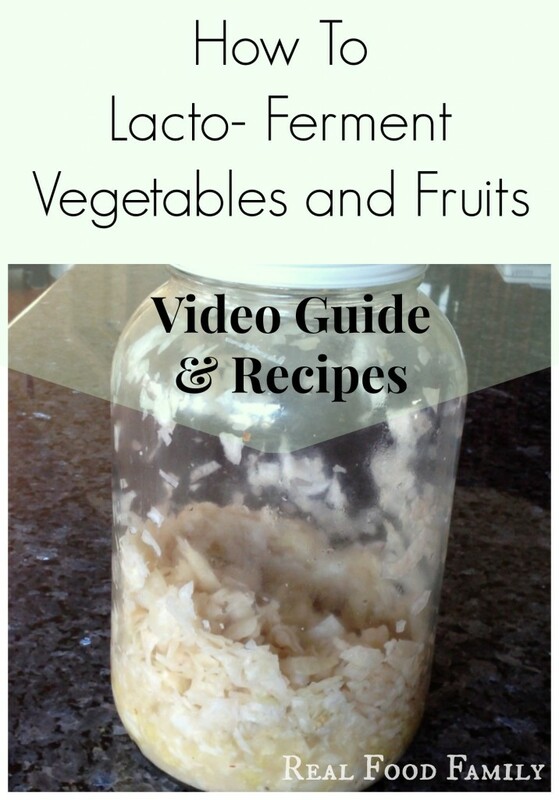 Use these recipes with the Basic Method above as a guide for creating your own lacto-fermented vegetables and fruits. Other ingredient options may include small pickling cucumbers, green beans, whole peeled garlic, or berries. Freshly squeezed fruit juices may be used for fermented drink options, the perfect alternative to carbonated beverages! Check out my recipe for Homemade Pickles here. Blend ingredients well using a food processor or blender, then continue with Basic Method, without adding any water. Gently mix ingredients without pounding and continue with Basic Method. Mix ingredients in a large jar. Cover with a towel or cheesecloth for 3 days, then strain juice to remove raspberry pulp and seeds. Seal with an airtight lid and refrigerate. Juice will become more effervescent with age, so release the seal every 1-2 days to avoid an explosion when opening. Check out this post devoted to making lacto-fermented beverages. I just started fermenting foods and I’m going to try your chutney recipe for sure because it sounds wonderful. I will be back to get those other recipes too at some point. Got ’em bookmarked! Thanks for your time and effort here and have a great day.